We're extremely excited to announce our newest feature - metadata injection - launching next week. Here's how it works: Manage your metadata on your SourceAudio site and it gets injected into the file when it's downloaded. It's that simple. No longer do you need to duplicate metadata management and embedding tasks on other 3rd party software systems in order to have your latest and greatest files available for download on your site. Simply manage your metadata as you normally would on your site and anytime it's downloaded, the metadata is injected into the file header like any of the other metadata injection systems you may currently use. Here's another awesome benefit of our new metadata injection feature: you don't have to conform to any standard fields - we can embed whatever is on your site. Your files can be easily read by iTunes, Windows Media Player, Winamp, Quicktime, or any other media player or music management interface that can read and display ID3 tags. Finally, your original files are not ever overwritten or re-embedded. 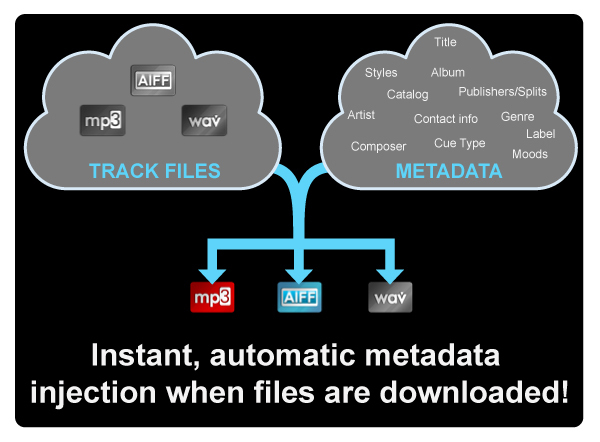 We literally create a new copy of the file, inject the metadata, and pass it through to the user at the point of download. Lastly, and best of all, this is a standard feature available to all clients on the network at no extra charge! We'll let everyone know when this is live, near the end of next week, but we're excited enough about it right now that we wanted to let you know ahead of time!